The Consulate-General of Japan in Brisbane in conjunction with the Japan Foundation, Sydney and the Bleeding Heart Gallery are proud to announce an upcoming exhibition titled “TOHOKU- Through the Eyes of Japanese Photographers”. This travelling exhibition consists of works by several photographers which together portray the past, present and future of the people and culture of the Tohoku region in northern Japan. 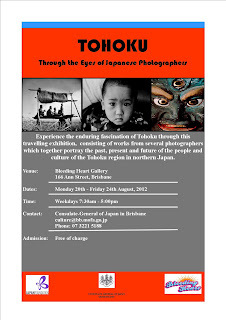 Works ranging from photographs taken in the 1940s to those taken in recent years will be on display, and the exhibition aims to give people throughout the world a feel for the enduring fascination of Tohoku. reconstruction following the Great East Japan Earthquake which struck the region in March 2011, but rather an effort to introduce to the world the land of the Tohoku region, its people and lifestyles.